With the creation of any ICT (information communication technology) there is always the utopian idea that the new innovation (whether it be Morse code, transcontinental railroads or the internet) will make the world seem smaller and lead to new relationships between cultures. In the past couple weeks there have been three events garnering wide attention in the blogosphere and mainstream press that have us examining US-China relations. It is worth taking a brief look at these three events in one space to capture what may become a defining moment. First, there is the news that Google may be pulling its service out of China. The Google-China relationship has been a storied and controversial one since the company struck a deal with the Chinese government in 2006. Mostly, this controversy is over obvious discrepancies between Google’s aim to provide free-flowing information to its users and the Chinese government’s efforts to censor online information (Google searches in China for “Tiananmen Square massacre” and “Dalai Lama” yield no results). Google’s latest threat comes after a series of sophisticated hacks into the gmail accounts of Chinese human rights activists. Additionally, the hacks could possibly have accessed critical corporate data from Google headquarters in Silicon Valley, although, they denied that any harm was done at that level. 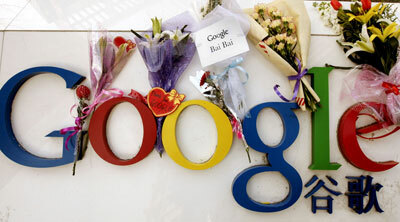 Many Chinese Google users have left flowers on the steps of the company’s offices in China, asking them to remain in the country. On the heels of Google’s clash with the Chinese government, Motorola announced that it is opening an online store in China, selling apps for cell phones that are powered by Google’s android. Ironically, Motorola also made a deal with Baidu, China’s #1 search engine (63.9% market share compared to Google’s 31.3% share in the country), to make Baidu their primary choice of search engines. This ensures that even if Google is out of China in the next couple of months, Chinese cell-users will still have plenty of access to applications and search engines. Motorola’s position in China is unique and should remain unchanged by whatever happens with Google. “This is the only app store for the Android platform in China that allows the ability to sell paid-for applications,” said Christy Wyatt, corporate vice president of software and services at Motorola. “If we want the best innovation from Chinese developers or global developers, it is important that they have the ability to market and sell applications.” (New York Times). Lastly, this week Secretary of State Hillary Clinton gave a speech on internet & democracy and the freedom of information at the Newseum in Washington DC. Advocating for a global internet free of censorship, Clinton called on China to investigate the attacks made on Google servers and more broadly, for the open sharing of information across countries. This unity in international norm-setting over internet policy may be a step in creating bridging cultural norms as well. The Secretary saying, “Countries or individuals that engage in cyber attacks should face consequences and international condemnation,” she said. “By reinforcing that message, we can create norms of behavior among states and encourage respect for the global networked commons.” (Washington Post). In the coming weeks and months we may be looking back to these past couple of weeks, asking how these events have helped or hindered US-China relations. Google’s presence in China represents (among other things) a core source of culture-share and transnational communication between our countries. Are Google and other internet services bridging cultural divides or simply raising virtual walls in place of physical ones of yesteryear?